Mid-Year Evaluation, and Lessons Learned and Re-Learned. Since I am self-employed I get to do my own employee evaluation! Did I meet expectations? ....It was Saturday night at 2A.M. 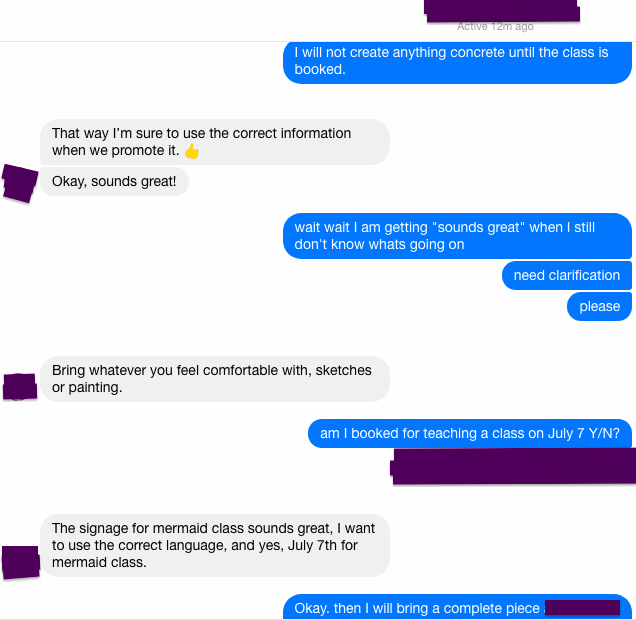 I am painting a subject for a class that is "booked" in two weeks. At least at this time I think it is, and I have the digital conversations confirming it. Before you think you know where this *entire* blog post is going, it's not about the lack of contract (100% my own mistake!)... though it's also a point in time where I have magically forgotten the thing our family attorney mentioned a few years back: "A couple of emails to each other is NOT a contract." The location has sent me the message, after having relatively successful events in the past with them- "go ahead and make the event for us, bring your demo and your signage tomorrow so that we may start promoting. Or something like that. It's really my fault for trying to plan it originally on too short notice, therefore spreading myself incredibly thin. So I feel crunched for time to get this done and get to my class the very next day in that location. But I can do it! I have done it before. I met with one of the owners/lessees of the location only Wednesday to discuss ideas and my head was filled with ideas and brainstorms from that, thinking any of them were anything other than ego stroking and lip service. Naturally I fell for the typical praise from an ersatz "gallery girl"... But back to 2A.M. Perhaps it was me simply not paying attention to the thermostat or something, or maybe the fact that I had just put a new bulb in my spotlight and there was fantastic lighting to get the painting looking great... but I was getting sleepy... and despite having a LOT of caffeine, my mind was starting to wander. The ceiling was looking a little swirly.... then, wait, why am I looking at the ceiling? Among all this, I still manage to rally and finish my painting. And then.... the next morning... 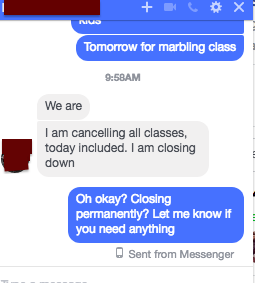 I received a message my classes were cancelled. No reason given. Of course I was furious, I think, between my delerium and trying to remember if what really happened in the middle of the night was a seizure... and trying to figure out if my finishing the painting was having a triumphant Dostoevsky-esque moment like the times he wrote about feeling great after one of his seizures (if you are not familiar with this, he is the only epileptic who seems to have described a euphoric feeling in his post-ictal states, it's really fascinating). I had been given zero notice, which hit me hard in the unprofessional feels. I also received two completely different stories about why the place was closed that day. but they use Facebook to break the news anyway. quote from Bojack Horseman, image meme-ified...so courtesy of soemone on reddit? 1) I do NOT have to take a job just because someone really really wants me to, or because they compliment me or my work a lot or appeal to my self-esteem. This is tricky because I have rocky self-esteem. 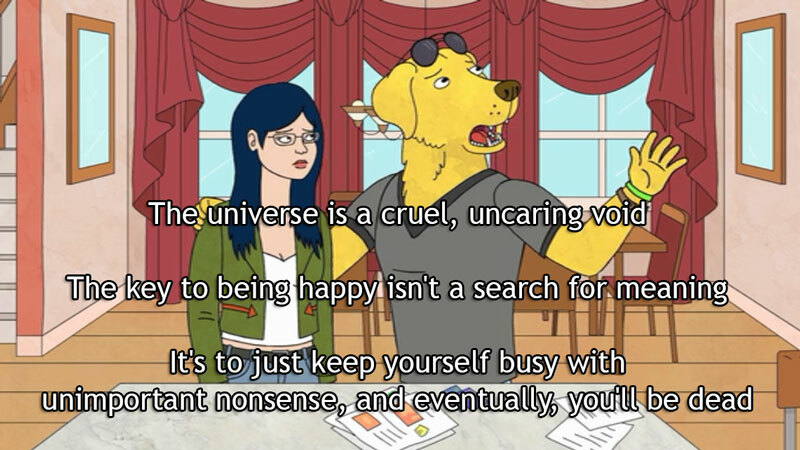 I need to maybe wear this reminder on a bracelet (kidding...but at least a note in my phone could help). I have to really look at my goals and my business plans and perform due diligence on the business asking me to do the job. 2) I need to quit grandfathering in people who know my friends and family. My father used to have a business in my hometown. This got him a lot of "social perks"... he also did a lot of deals on a handshake that would not have flown at the job from which he retired that paid all our bills. My job as an artist is intended to pay bills... so that means these social perks and handshakes cannot always fly. I will still maintain that repeat clients will get the treatment I always like to give repeat clients (which means any time I can save them money on my labor costs I will) but that is a specific scenario. My first steps to making this change immediately are dusting off my contracts book (Tad Crawford) and my G.A.G. Pricing and Ethical guidebook... both great primers for legalese for artists and dealing with the business stuff. 3) I do NOT have to post on social media to PROVE I am working, no matter how many times I see other people doing it, whether it be Facebook Live, Instagram, or just a posted-anywhere factually incorrect statement or stolen photo that I know is shopped. If I know the advice comes from a bad source, I do not need to call it out. I need to quit being a know-it-all (see above re: ego rampage) and learn to simply be a better contributor of helpful content. I will admit my most popular post on this blog - my paint-and-sip confessions post - reads like a gossip rag, but I feel it is the best evergreen contribution I can make on the topic, as it is not an advertisement for any one business, and answers questions that many were asking about its type of business model, without fully leaking the secrets and individual pricing formulas of the companies. I also am perfectly allowed to curate who my "friends" list may contain, and keep others on the public view only. I reserve the right to speak honestly in messages, and be 100% transparent with anyone with whom I speak, regardless if they are with me. 4) I do not need to be excessively polite and prim and proper and 'ladylike' simply because I am female, nor submissive to any male artist or gallery owner. By the same token I do not need to be handed off to a wife or perform social graces in place of regular business meetings if the professional point of contact cannot handle a regular business meeting. I will be as professional as I need to be, but I will never be submissive to an abusive person, and will stand up for my copyrights and rights to protect my works from physical damages. If I make a suggestion and the gallery says "no" and then blames me for the results of their not taking the suggestion, that is fine, but the consequences, benefits, or lackthereof are still on them even if they blame me or another artist, or a bank, or the "economy just being bad", or the wind changing or Mercury in retrograde (ha!) until the proverbial cows come home... Not my circus, not my monkeys (can that be verbatim in my contract?) A owner blaming others for a bad business model is probably the worst thing for an artist to experience, but thankfully...it's easy to move away from! Having lived for 20 years with a neurological illness that could kill me at any time, I do not have time for excuses or lies, but I have lots of time to be helpful, and useful, and I have learned to work quickly and brainstorm efficiently. I have a life to live, a job to do and I am a bouncer-backer! 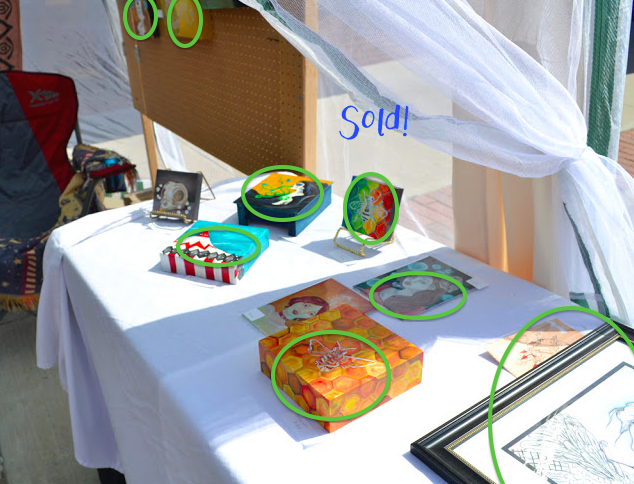 A photo of an event I did at a show where I had a run of bad luck...but it's okay, because all the circled pieces have sold since! One bad day is what it is...we get over it. 5) Gratitude. 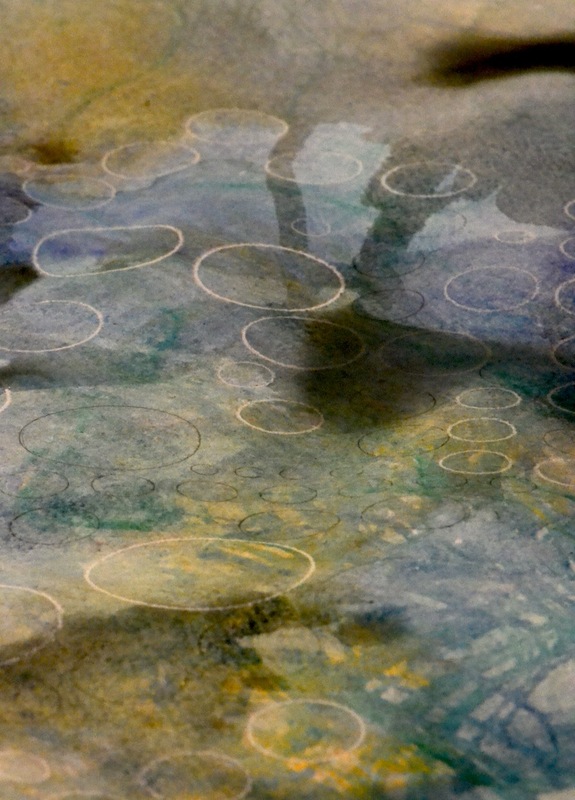 I have much for which to be thankful, including a loving husband that is so supportive of my art career. He has always stood by me in anything I want to do in this regard, and it's pretty difficult to watch him get frustrated when I have health issues or stress issues or health issues because of stress. But, I am truly blessed to have this support in my life, and we even recently got the loving support of a new furbaby, and have been able to take a wonderful vacation, even if only for a couple of days. Sometimes just getting away for a bit is so much help to recenter and be inspired, and I am happy that I value open and honest communication to let people know where I will be, and grateful for all those along the way who have made it possible for me to even budget a break. Even the little gigs I get and the very small commissions, even little bit helps. 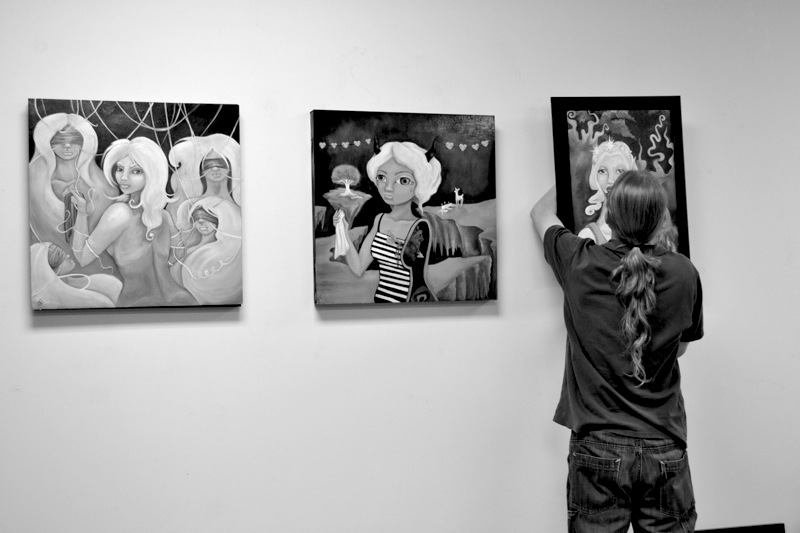 My husband helps install my work at an exhibit featuring my oil paintings. He is great at this stuff. And finally... my overall takeaway is... I just need to keep my head down, nose to the grindstone, and put out the art and do what I do best, which is efficiently create. I don't see myself as ever 'against' anyone... art just doesn't work like that for me anymore (yes, at one point it did, and that's a blog post for another time). If you are an artist you probably already realize we have plenty of problems without getting in each others' way. If you make art as well I probably want to work with you. If you like my art I probably want to work for you. Let's talk about this sometime.